Jett Tailfin Racers is a fun karting-style racing game, but it's fishy. 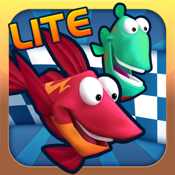 Jett Tailfin Racers is an underwater racing adventure with Jett Tailfin and his friends as they compete for Top Fin! Amazing environments, fun characters and awesome speed combine to get your racing fins going! You take on the role of Jett Tailfin and his friends, racing through various undersea courses. The sea can be a dangerous place, though - look out for shark attacks! and octopi that can hamper your progress. You do want to recharge by swimming through the bubble streams or get a really good boost by navigating through the jet streams that can whiz you to first place.